The body is well designed, inclined monocular with sturdy base, overall height 500mm. The coarse motion is by rack and pinion arrangement. The dome is having precise screen and condenser 150mm. the illumination is with powerful condenser for high intensity of light, low voltage lamp to work on built-in transformer. 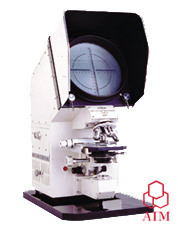 The object is projected on the optical glass screen having 150mm dia. The dome fits on the tube of Microscope and can be rotated in all directions. Transformer 12 Volts, 36 Watts with lamp and detachable mechanical stage. Optics : Ach. Objective : 10x & 45x. Huy. Eye Pieces : 10x & 15x. Total Magnification : 100x - 675x. Observation Screen - 200mm graduated screen, built-in Fresnel lens, loop and arrow arrangement and coaxial mechanical stage of size 135X120mm. Nosepiece - Quadruple revolving nosepiece Magnification - Provide magnification from 125x to 1000x. Illumination - Halogen lamp 12 volts, 100 watts, workable on 220V/110V AC. Objectives- 5x,10x,20x,40x.Eyepiece - WF 10x paired. 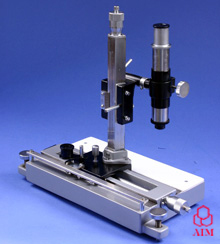 AIM Travelling Microscope consists of a cast iron base with machined-Vee-top surface and is fitted with three levelling screws. A matallic carriage, clamped to a spring loaded bar slides with its attached vernier and reading lens along an inlaid strip of metal scale. The scale is divided in half millimeters. Fine adjustments are made by means of a micrometer screw for taking accurate reading. Both vernier reading to 0.01mm or 0.02mm. 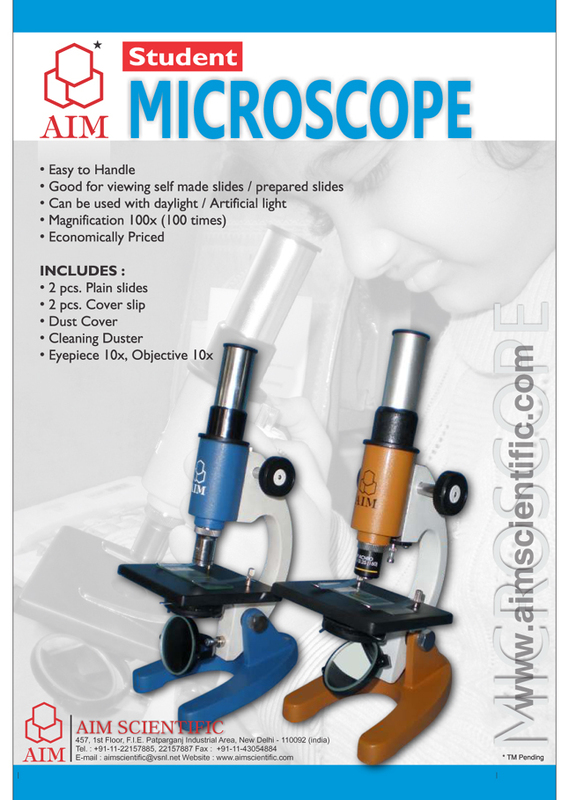 Microscope tube consists of 10x Eyepice and 15mm or 50mm or 75mm objectives. 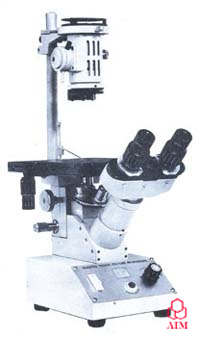 The Microscope, with its rack and pinion attachment is mounted on a vertical slide, which too, runs with an attached vernier along the vertical scale. The microscope is free to rotate n vertical plane. 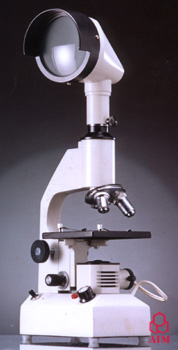 The vertical guide bar is coupled to the horizontal carriage of the microscope. for holding objects a horizontal stage made of a milki conolite sheet is provided in the base. Binocular Inverted Tissue Culture Microscope with quadruple revolving nosepiece, equipped with AIM Binocular head assembled from imported prisms and best quality optical components having full prismatic optical path. Large specimen stage with extension plates, coarse and graduated slow motion knobs. Variable intensity controlled solid-stat transformer powered 20 watts Halogen built-in-base, illumination based on Keohler system. Optics : Ach. Objectives : 5x, 10x, LWD 20x & LWD 40x.